The photograph above is of the village of Tseria on the Mani, with the Taygetos Mountains in the background. 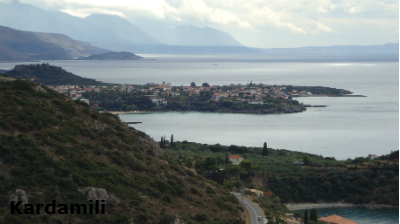 This photograph was taken above Diakopto from the road going up to Kalavryta looking down at the Gulf of Corinth and over to the mainland and the mountains beyond. The views from up there are stunning. The view of the Chelmos Mountains was taken between Kalavryta and Kastria on my way back from visiting the Cave of Lakes. Aroania, also known as Chelmos, is a mountain range in Achaea, in the Peloponnese. 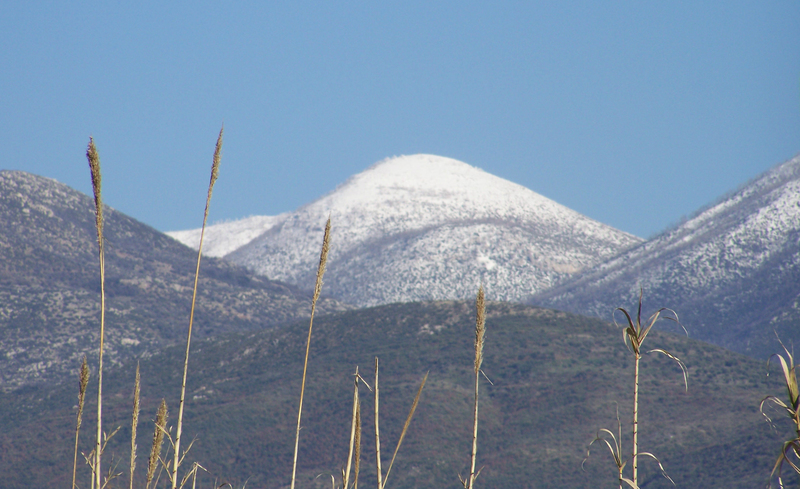 At 2,355 m high, Aroania is the third highest mountain of the Peloponnese, after Taygetus and Kyllini, and the highest in Achaea. 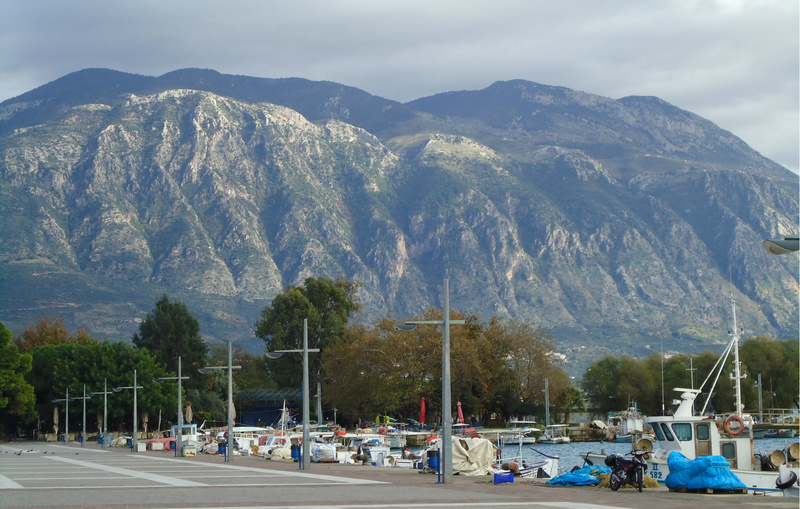 The largest town near the mountain is Kalavryta. 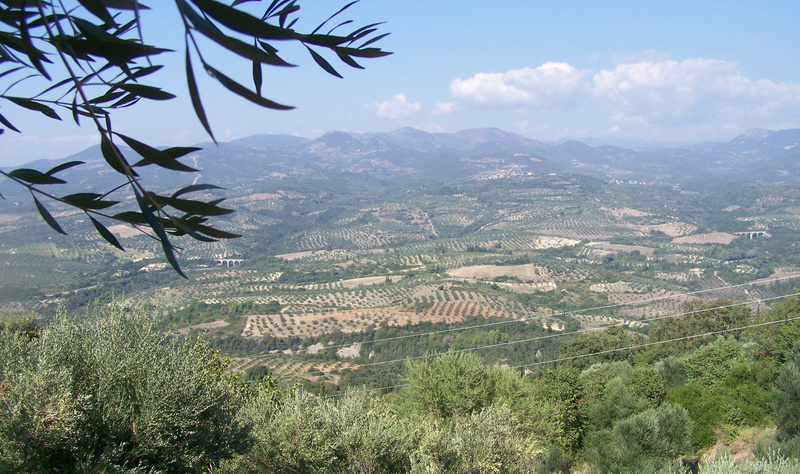 This photograph was taken from the mountains above Aetos looking down across the Messinian plain. 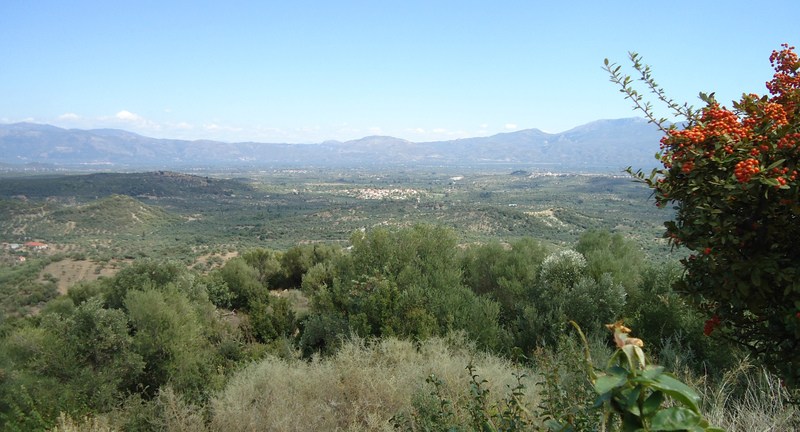 The road leads through the mountains and down into Kyparissia. This is a view of Kardamili taken from above the bay, it shows the Taygetos Mountains in the distance. 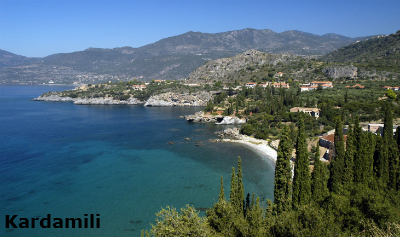 Kardamili is very picturesqe and unspoilt and is one of the oldest settlements in the Peloponnese. Many of the buildings in Pano Kardamili (the old village) date back to the Venetians. Photograph of Kardamili is courtesy of Alan_W100 at Flickr. 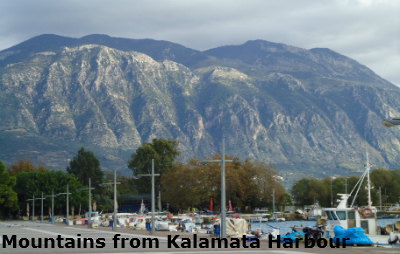 Kardamyli is the departure point of many mountain trails, there is a very good hiking map available for serious walkers. 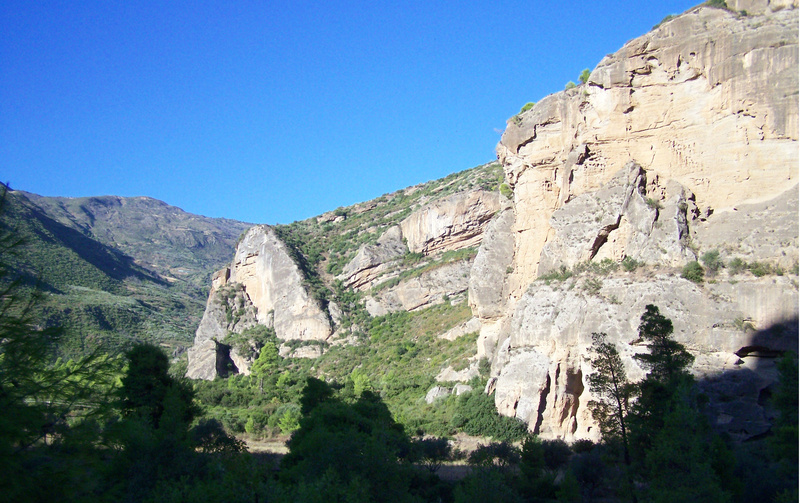 Nearby is the Viros Gorge, with a total length of 20 km. Just outside Kardamili was the home of Patrick & Joan Leigh Fermor. Patrick, a writer, was immortalised in the film "Ill Met By Mooonlight" a true story of his exploits with the Greek Resistance during WWII, especially in Crete. He was made an honorary citizen of Kardamili and died in 2011 the day after returning from the village to his home in the UK. These are the mountains that we can see from our house, though not often covered in snow. Looking at a map I believe the tallest one is called Mount Tetartio. There are many roads up into the mountains that go through some wonderful little villages, and the views from the heights are amazing. Tripoli is located in the centre of the Peloponnese, in a broad basin approximately 650m above sea level. 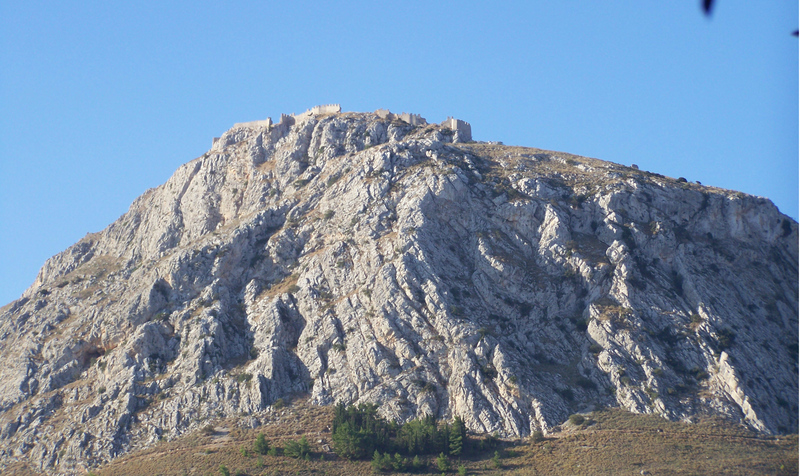 Tripoli is surrounded by thickly wooded mountains on all sides, the tallest and closest of which is Mount Mainalon to the northwest. 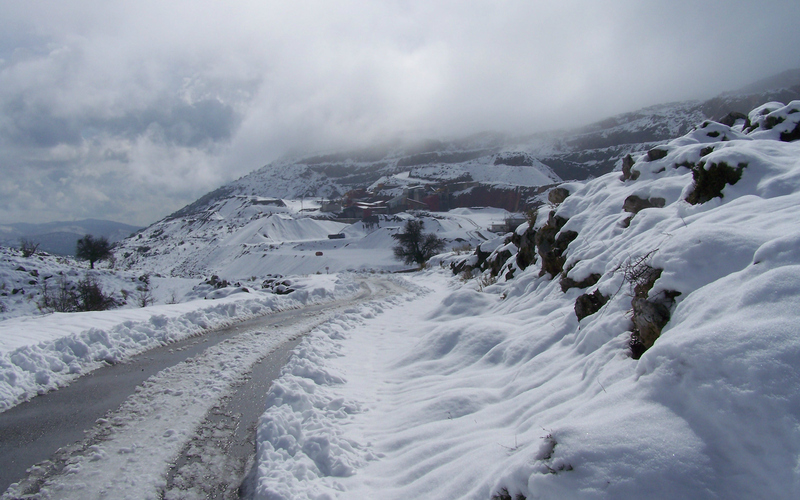 The mountains near Tripoli are often covered in snow in the winter. 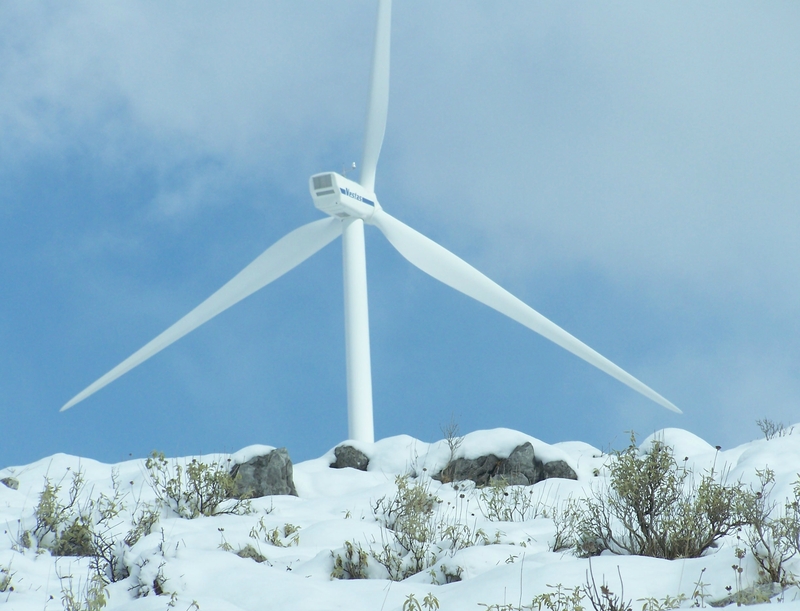 When I see snow on the mountains near us, I often take the car and go snow hunting. This photograph was taken in 2012 when we had a very cold winter. The mountains stretch away into the distance. 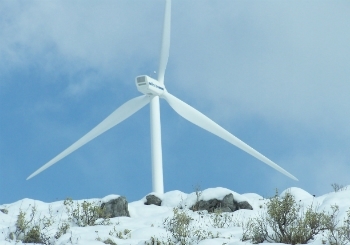 There are many wind turbines in the area, at a distance they are majestic, up close they are beautiful, the photograph does not do it justice!! 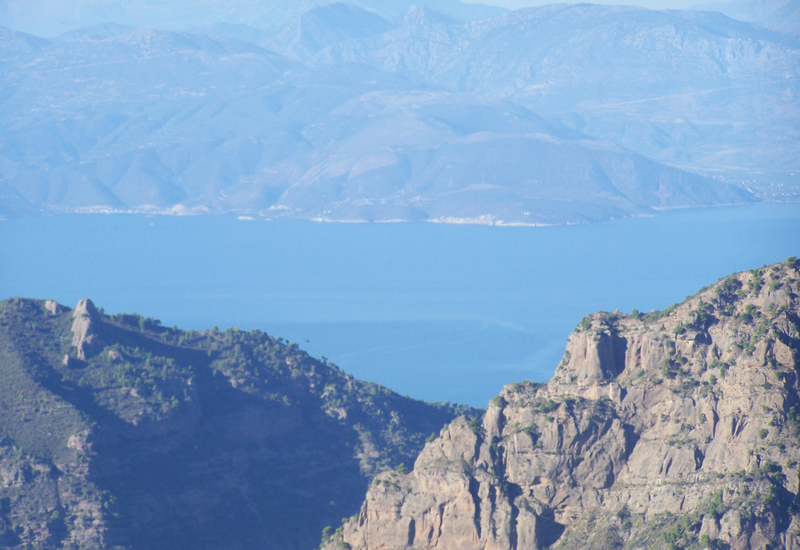 The Taygetos Mountain range is about 100km long, extending from the centre of the Peloponnese to Cape Matapan in South Mani. 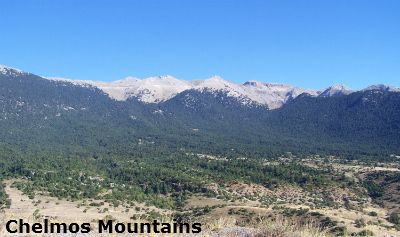 It contains the tallest mountain in the Peloponnese, the Profitis Ilias , reaching 2,404 m. Taygetos overlooks the cities of Sparti and Kalamata, whose skyline it dominates. 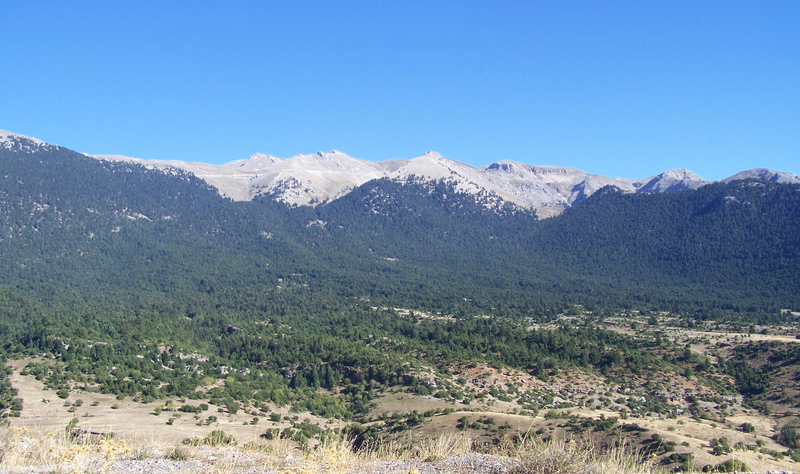 The slopes of Taygetos are heavily forested, primarily with Greek fir (Abies cephallonica) and black pine (Pinus nigra). Devastating fires in 2005 and 2007 consumed much of the forests on the central west slopes, and only about half remain. 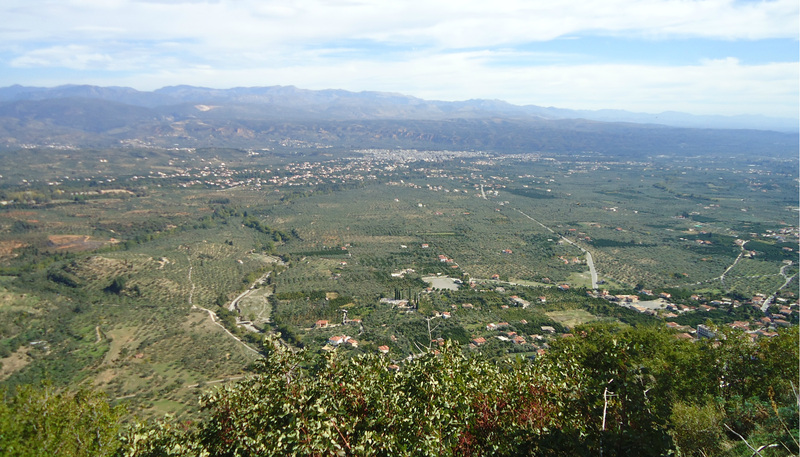 There is an amazing view from the top of the fortress at Mystras, which is situated on Mount Taygetos, looking down over Sparti in the distance. 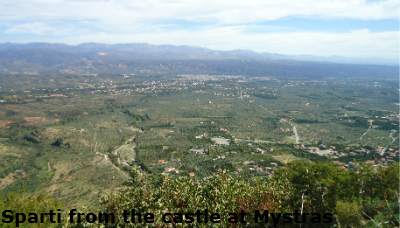 Mystras was virtually abandoned in the 1800's when the new town of Sparti was built, approximately eight kilometres to the east. 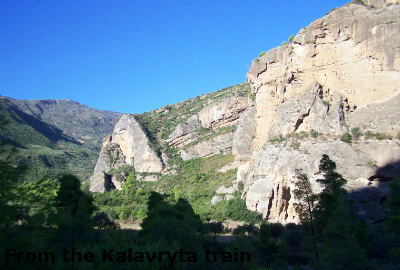 There are some fantastic views of the mountains above the Vouraikos gorge from the Diakopto to Kalavryta train. For the whole of the trip there are cliffs, mountains and forests. 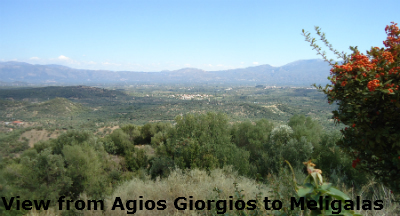 The view from the church of Agios Giorgios on Mount Ithome looks out across the villages of Neo Chori, towards Meligalas to the right and many other villages in the basin. 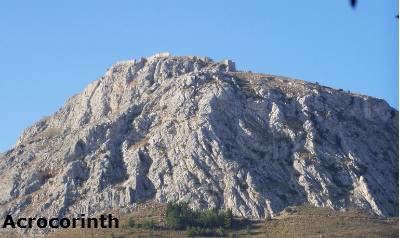 If you are travelling anywhere near Corith, the imposing hill of Acrocorinth (not a mountain) at 575m, dominates the landscape. 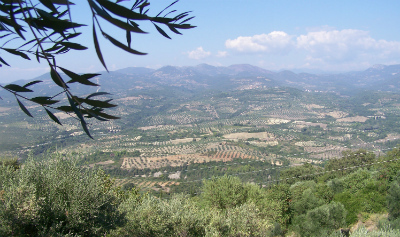 It can be seen for miles along both the Kalamata to Athens road and also from the road from Corinth to Patra. 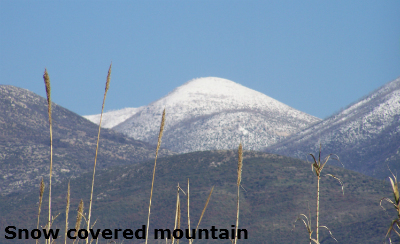 There are so many mountains in the Peloponnese - these photographs show only a few of them. The whole landscape shows how volcanic the region must have been long ago.